Reward Yourself, Reward Your Friends! Being a FTS customer has its rewards – like getting free service just for spreading the savings to your Friends, Family and Businesses. In fact, every time you refer a Friend, Family member or Business, you will get half of their first month’s bill credited to your account. The more you refer, the more you save. There’s no limit to the savings you can enjoy! If you’re not a FTS customer, don´t worry just go to become an agent and sign up to become one, then when you refer customers we will send you a check for your hard work! 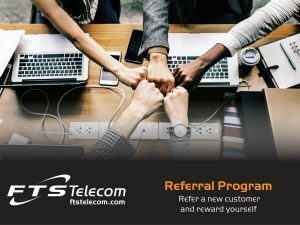 Program Overview: The FTS Telecom Referral Program (“Referral Program”) provides the opportunity to refer your friends, colleagues, and associates to FTS Telecom and receive compensation. You do not have to be a FTS Telecom customer to participate in the Referral Program. Promotion Details: For a limited time only, FTS Telecom will award cash or an account credit (“Reward”) to any Eligible Referrer (as defined below) who refers an Eligible New Customer (as defined below) who signs up for a business plan and activates service. The Reward will be issued only after the Eligible New Customer’s account has been active and in good standing for 90 days. If an award of cash is elected, a W-9 tax form must be completed and submitted prior to issuance of the Reward. Definition of an Eligible Referrer: An Eligible Referrer is a person or business entity who refers an Eligible New Customer (as defined below) to FTS Telecom in accordance with these Referral Program rules. If you are an existing FTS Telecom customer, to qualify as an Eligible Referrer, your existing account(s) must be active and in good standing at the time of the referral and must remain active and in good standing for a minimum of 90 days after the Eligible New Customer’s account has been activated. Existing FTS Telecom business customers, and former FTS Telecom customers whose accounts were cancelled or terminated are prohibited from referring themselves. Owners and employees are prohibited from referring their respective employers and are ineligible to receive a Reward for such referral. Definition of an Eligible New Customer: An Eligible New Customer is any new customer who signs up for a business plan and whose account is active and in good standing for at least 90 days after activation and in compliance with FTS Telecom’ Terms of Service before an Eligible Referrer is eligible for a Reward. Former FTS Telecom customers are prohibited from qualifying as an Eligible New Customer. Referral Verification: Once a referral is submitted, it is reviewed to determine if it is a Qualified Lead by FTS Telecom (as defined below). At the time of referral submission, we request a completed W-9 tax form so we can pre-process this information and proceed should the lead become an Eligible New Customer. If an Eligible New Customer is referred by more than one Eligible Referrer, only the Eligible Referrer validated by FTS Telecom shall be entitled to receive the Reward. Definition of a Qualified Lead: A qualified lead is defined as a new contact in a decision-making role at an organization not already registered as a FTS Telecom lead that is in the market for and in a position to purchase a hosted PBX system from FTS Telecom. Reward Issuance: If there are options within the promotion for method of award issuance, it is the sole responsibility of the referrer to communicate the desired award to their FTS Telecom sales rep, or Customer Care at (407) 331-8622. A W-9 form must be completed, submitted and approved for all rewards, regardless of method, prior to issuance of reward. The W-9 form must match the name of the person or Company receiving the award. If no specific election of reward issuance method has been made, a cash reward will be issued to the referrer on file. If a valid W-9 form has not been received and approved within 180 days of reward eligibility (90 days after referred customer has activated their account), the reward will be forfeited. In the event the referring party’s account has a past due balance, that balance will be deducted from the referral fee. Important Notes: FTS Telecom reserves the right in its sole discretion to amend, adjust, change or discontinue any terms described herein without prior notice. FTS Telecom retains sole discretion and authority to interpret all aspects of the referral program including, but not limited to, criteria, eligibility, amount and/or frequency of payments and whether such payments will be made. Any specific details or notes?